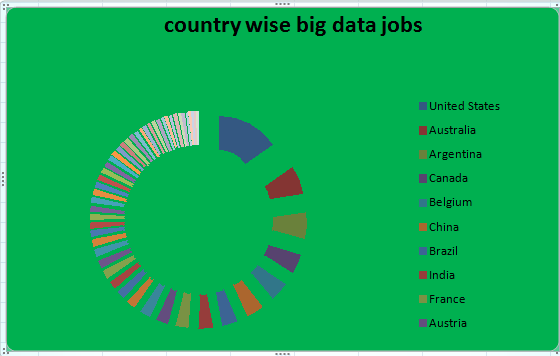 In this weekend I did some research on big data jobs world wide.For this analysis I took big data job postings from most of the job portals for January 2015.I would like to share some of the insights I got on the same.This might help big data job seekers. Below are top 10 countries recruited in the world for Jan 2015. US tops this list holding 15 percentage of jobs.Australia (7 %) and Argentina (7%) take next places.and India (4%) is in ninth place. 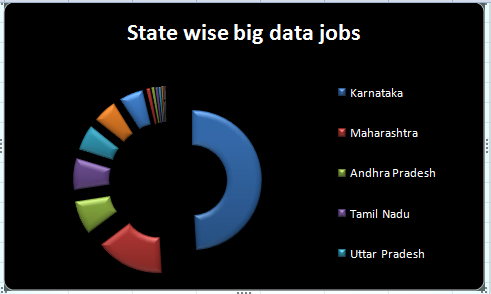 In India ,Below are top 10 states which recruited on Big data in Jan 2015. Karnataka tops this list with around 50 percentage of jobs. Maharastra (16 %) and Andhra pradesh (8%) take next places. Below are job titles/positions mostly used/filled in Jan 2015. Data scientist position tops with around 10 percent of jobs. 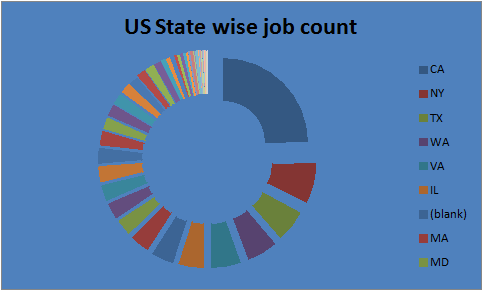 In US,Below are top 10 states recruiting on big data. California tops this list with around 25 % of jobs,and New york (8%) and Texas (6%) took next places . Hope this article helps you to understand big data job market. 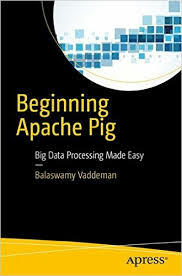 Good Luck for your big data job.